I first wasted some time with Blender’s translation system, but soon gave up on it. It seems impossible to override words that have already been translated in other contexts of Blender. And it’s a general pain to work with. Took me several attempts to get to a good system of my own, but in the end it is extremely simple. It works like a charm and more addons could be using it. So I’d love to share it with you. There are already many of the same words translated, and it seems impossible to overrule ones that are incorrect in the specific context of the Grove. Although Blender’s translation system does allow for contexts, it seems impossible to use in addons. Blender’s existing translations are inconsistent in use of caps and generally incomplete. 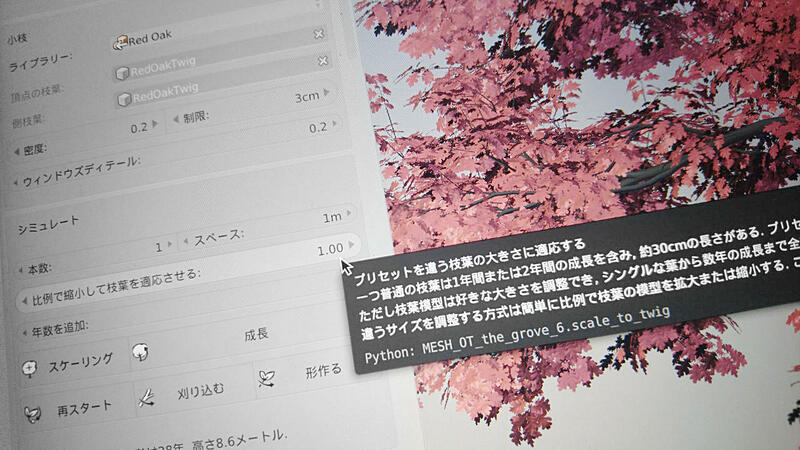 Blender’s included translations can change without you knowing. Its dictionary format is very hard to work with, especially for translators. Doesn’t allow translation of more strings than just those used in the interface, like interface messages and terminal console messages. The way it works is I have a file Translations.py that imports the right dictionary based on the selected language. Other than that, there’s just a simple function called “t” that takes a string ( variable name in my case ) and returns the translation from the dictionary.
""" Translate the give phrase into Blender's current language. """ Missing keys are printed to the terminal – a handy tool to see which translations are missing. The _tt suffix denotes that this is a tooltip. Here you can see why I called the function “t”, it’s as short as can be and won’t distract from the rest of the code. This translation is only done once, when the addon is loaded, so it has almost no impact. A downside of this system is that you will have to reload scripts to see the newly selected language. As you see, the system is extremely simple. Let me know if you found this useful or if you have trouble implementing this code.